Original, Jan 2008. Brian McLaren is asked by Sierra Club radio to talk about the environment and theology from a Christian and evangelical viewpoint. Listen here. Brian speaks really well and its a good intro to his book called Everything Must Change, which outlines a plan to tackle the spiraling threat of a dysfunctional economical system. Brian will be speaking at DAVOS World Economic Forum in Switzerland this week and will be rubbing shoulders with some of the world’s top leaders in their fields. I hope he is able to bring God’s agenda to the table. Brian’s book Everything Must Change is his most important book and is totally worth reading and familiarizing yourself with. You may not agree with everything. I cant say that I did . But you cant ignore his book, or these issues of the environment, economy and the message of Jesus. You can also catch him at the Deep Shift tour around USA. I think you will be sorry if you miss it. Amen, brutha Andrew! Preach it. As I’m learning in my Foresight degree program, we need to have an eye toward our future or risk foolish consequences. I realize you’re not into fulfilled eschatology, but I appreciate you challenging me five years ago (not directly, but in what you were sharing around Greenbelt and Wabi-Sabi) to apply the life and power of Christ to every sphere of life in order to be the answer to Jesus’ prayer to bring heaven to earth. And yeah, everyone…come to the tour! I’ll be facilitating a little on Food: Local, Slow, and Urban-Grown: Jesus’ Subversive Meal-Sharing Practices and Us! at the Charlotte stop. I’d love to see you. 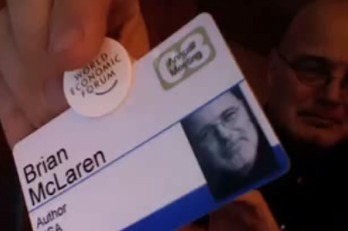 What is McLaren doing at the World Economic Summit in Davos that could possibly relate to his work as a minister of the gospel? Wasn’t the message of Jesus — in other words, God’s agenda — “repent, for the kingdom of heaven is at hand”? derek, i have no idea if your comment is serious or tongue-in-cheek. The Deep Shift Tour began a couple of days ago – Nick was there and has blogged about it (I expect there are other bloggers writing about it too). I’m going when the tour reaches the Chicago area (not until April 4-5). Thanks for the HT Andrew. Also, lets just assume that for the sake of a great blog (yours), Derek’s comment was seriously tongue-in-cheek!! At least that lets me sleep better. Thanks again for all you represent! Previous Post (p)	F11: now thats a storm!